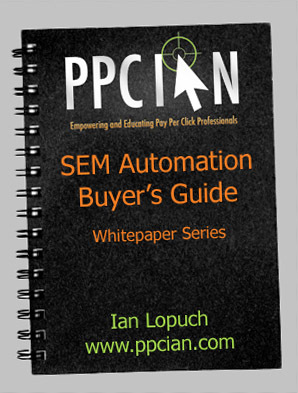 For those who have been reading PPC Ian for a while, you know that I’m a fan of investing. Investing is a passion of mine, and it makes sense, it’s all about the numbers (just like customer acquisition marketing). Today, I wanted to write about Lending Club, and why Lending Club is especially relevant to those of us in the digital marketing field. Disclaimer: I’m not a financial advisor and this is not financial advice. Please consult your own financial advisor before making any investment decisions. New accounts have very few defaults because they are new. Over two years later, I have experienced a handful of defaults. These are to be expected and have lowered my overall return. We’re comparing a mature account to a brand new one. My principal and interest reinvestments have largely been focused on lower-risk loans. These carry lower interest rates. I wanted to start building my portfolio with a low-risk base, and layer in higher risk loans once the base is established. In today’s market (more on this later), 7.64% net annualized return is no joke, that’s a great number, one that can generate some serious returns when compounded over time for a number of years. I’m hoping it holds in this range for the long-term! These days, I’m focused on building my Lending Club portfolio for a multitude of reasons. I wanted to share why I think it’s great for digital marketing professionals and why I’m so focused on Lending Club. Did you know that Google Invested In Lending Club? As a digital marketing professional, I watch Google very closely, not only their core Search business, but their investments across-the-board. Google’s investment in Lending Club makes Lending Club even more relevant for those in the digital marketing career, from the simple perspective that Lending Club is now partially Google-backed. Become a Lending Club investor and you have one more lunch/dinner conversation topic for your Google meetings as well. I’m a big fan of finding common topics of interest in networking and building one’s career. Lending Club is a great topic! 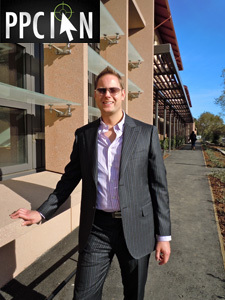 Did you know that one of my old bosses is on the management team Lending Club? As someone who was a really super boss (and someone who gets digital marketing), I put a lot of faith in the Lending Club platform for this reason. Lending Club has a solid management team. It’s all about the people, and I like to invest in great people and great management teams. Lending Club offers financial flexibility via massive cashflow, more than most other investments I have experienced. Do you live in the SF Bay Area or another expensive area? 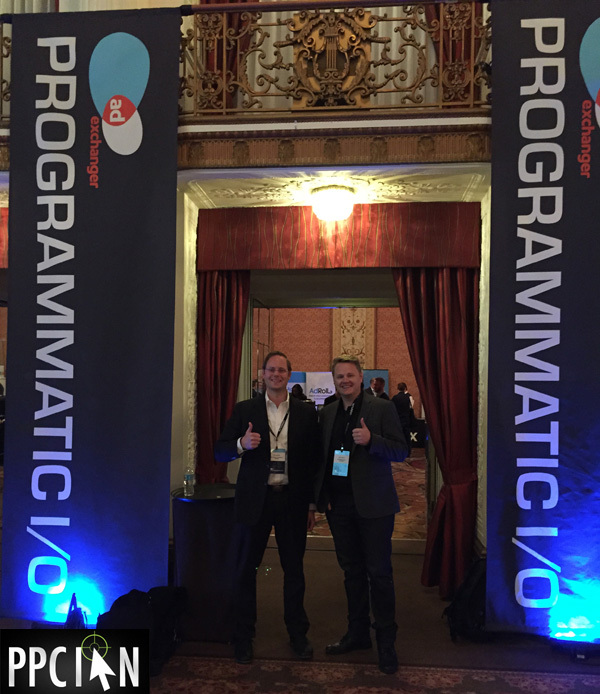 Chances are “yes” if you work in enterprise-level customer acquisition. As someone who knows first-hand how expensive it is to live around here, I like investments that offer flexibility. Lending Club is just that. On a regular basis, you receive cash flow from Lending Club, both principal and interest. It’s up to you whether you want to reinvest that money or withdraw. If it’s a time where you need some extra cash, you can just withdraw the principal and interest as it’s paid out. The coolest part: You don’t have to sell any loans to access the cash flow. There have been times when I have needed some extra money and I have withdrawn from my cash flow. There are other times (like recently) where I have reinvested. For this reason, I view LendingClub as a very flexible vehicle. There are not a lot of investment opportunities right now that offer superior levels of return. In the Bay Area, real estate prices are sky high. The stock market is at all time highs (although there are pockets of opportunity for savvy investors). By disintermediating the middle man, Lending Club has carved out a niche where you can still receive some great returns on your invested capital. It’s really fun. I like to mine through data, as a data-driven digital marketer. Lending Club offers a ton of data and opportunity to get as detail-oriented as you want when choosing your strategy. I like helping others! 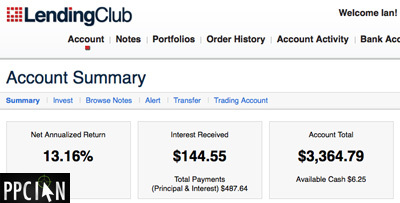 Each time I invest $25 in a Lending Club loan, I can sleep at night that I’m helping someone out. Lending Club offers great interest rates to borrowers and helps people in their time of need: Credit card debt consolidation, financing work on their home, funding medical expenses, and so many other scenarios. I feel like I’m investing in people. On the flip side, I feel like the borrowers know that and do their best to pay back the loans since their fellow peer is helping them out. Great returns come to those that help others. As always, it makes sense to be financially prudent, and only invest what you can afford to lose. Why not start small and then add a little bit over time? I personally take advantage of recurring auto-deposits to my Lending Club account so I’m able to invest in a few new loans at a time, on a recurring basis. This spreads my risk (in case a group of bad loans are clumped together) and also since I’m only risking a little bit of money at a time. Important Disclaimer: I’m not a financial advisor and this is not financial advice. This post is just for entertainment purposes. Please consult your own financial advisor before making any investment decisions. Today, I’m thrilled to share greater context behind my overall Lending Club strategy, how I personally pick Lending Club loans. Without further ado, here’s how I pick Lending Club loans worthy of investment. Rule 1: Don’t let Lending Club pick loans for you. Rather, click the little link to “browse notes” so you have full control over the precise notes in which you invest. How do I sort through the notes? Check out the next few bullet points! Rule 2: Invest in notes that don’t have many days left in their funding cycle. The more days you have your cash sitting around, the less interest you will earn. Also, loans closer to becoming fully funded are typically of higher quality (in my opinion). Why? Partially funded loans can always be reviewed by Lending Club staff and get rejected. If they’re closer to being fully funded, it’s likely they’ve been reviewed and are good loans. Moreover, you’re taking advantage of the collective intelligence of other investors. Go to the popular loans. Rule 3: Invest in low dollar amount loans. It’s a lot easier to pay back a $3,000 loan versus a $30,000 one. Generally, I feel like those taking out smaller loans have a more targeted, specific need for the money. They are more likely legit people. I get a bit concerned when folks are taking out major loans. As such, I’m sticking with small loans these days. Rule 4: Go with “A” and “B” loans. I’m a conservative investor and want to minimize loan defaults. I feel that it’s essential to stick with the top-rated loans to achieve this goal. Rule 5: Stick with debt refinance loans. It’s a simple equation: You take a high interest rate and consolidate your debt into a lower interest rate with Lending Club (bypassing the middle man). As compared to loans for other purposes, I just feel safer going with debt refinance loans since they’re all about saving someone money and reducing their monthly expenses (as compared to increasing their expenses, the case with other loans). These tips are definitely not the only criteria for evaluating Lending Club loans, but definitely should provide a great starting point. My strategy is constantly evolving and these rules mark some of my latest thinking. Do you invest in Lending Club? Any special strategies for investing in Lending Club notes? Important Note: I’m not a financial advisor and this is not financial advice. Please consult your own financial advisor before making any investment decisions. If you’re in the world of online marketing (or any other career for that matter), it’s important to have both a short and long-term plan when it comes to your finances. This year, I set the goal to save money and invest wisely (you can check out my 2012 goals here). Each and every day, I try to remind myself to save as much money as possible. In that spirit, I have been embracing some new investment vehicles, one of which is LendingClub. What is Lending Club? It’s a peer-to-peer lending platform that allows normal people like you and me to lend money to others. Those who need to borrow money (often for such purposes as consolidating debt) get a much lower interest rate than credit card companies. Those who lend the money, get a much higher interest rate than is available anywhere else. In short: Both lenders and borrowers win! I started investing on Lending Club in October of 2011, wrote my first post on PPC Ian about Lending Club in late February (check it out here), and am now ready for another exciting update! 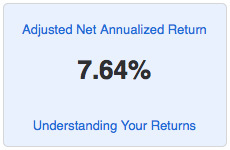 As you can see in the screenshot below, my current net annualized return is 12.99%. I’m excited about that because it’s only down a little from 13.04% in late February. Since I’m newer to Lending Club, I expect my net annualized return to dip over time since some of my loans will default. In addition to my consistent high returns, I’m now invested in 173 loans (2 of which are in funding). I wanted to briefly highlight my Lending Club strategy today because I feel that it will be core to my continued success with this peer-to-peer investment platform. The best way to illustrate my strategy is through numbers. My total Lending Club account value is $4,137.27. Of that amount, $4,048.66 is invested in 173 loans. If you divide $4,048.66 by 173 loans, I’ve got an average of $23.40 in each loan. However, if you’re new to Lending Club, you may know that the minimum you can invest is $25. That is absolutely true. However, the real magic here is that your loans get paid off each and every month. If you start small, consistently add more money, regularly reinvest your profits, and grow your portfolio over time, you will get into a sweet situation where you have less than $25 in each loan, on average. It’s really as simple as that. You don’t want to drop down a large amount of money all at once. You want to invest slowly over time, also known as dollar cost averaging. As your loans get paid off, you want to invest the proceeds is more loans. Eventually, you will have diversified into many different notes, with different start dates, and will have less than $25 in each loan. It’s all about persistence, diversification, and longevity. It’s not rocket science, but it definitely works (based on my experience so far). So, there you have it, my Lending Club investment strategy. Thanks so much and best of luck in your own investing! I’m looking forward to my next update. 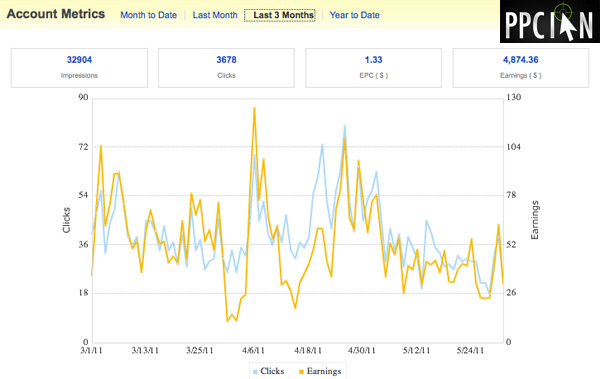 If you’ve been reading PPC Ian for a while, you know saving money and investing wisely is my number one goal for 2012. When it comes to investing, I’m a huge fan of dividends and also interest income. 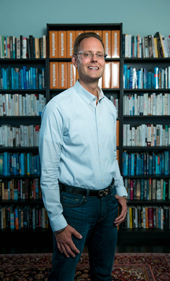 Today, I’d like to highlight one of my favorite places to invest: LendingClub. Check out the screenshot to the right, that’s my personal Lending Club account. I started investing in August, 2011. Since then, I have been contributing money on a regular basis. All my investments have added up and I currently have $3,369.15 in my account. My net annualized return is 13.06%. That’s right. The same money in my savings account (or even high yield savings account) would be yielding less than 1%. 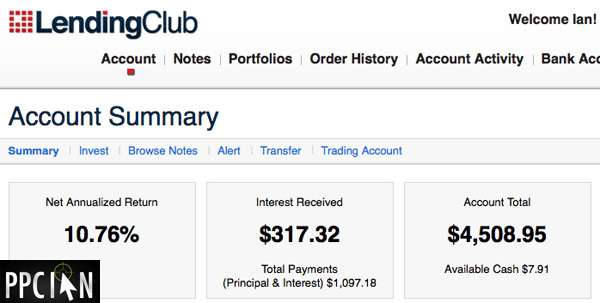 Lending Club is bringing in a huge 13.06% return, sweet! So what is Lending Club? It’s a really cool platform that facilitates peer to peer lending. Lending Club finds people who need to borrow money. A good amount of the borrowers need to borrow to consolidate credit card debt at a lower interest rate. They screen the individuals, assess their risk bucket, and then allow them to borrow money from Lending Club investors (like me). Bypassing the middleman (banks), Lending Club makes the borrowing/lending process much more efficient. Lending Club means better interest rates for borrowers and better interest rates for investors. Finally, investors like myself get to taste the good life like the big banks who have been making so much money all these years. Here’s my personal strategy: Lending Club lets you invest as little as $25 in each note. Therefore, I invest in as many notes as possible to spread my risk around. If any one note doesn’t work out, I don’t sweat it at all. I’m currently invested in 143 notes, with two more in funding. So far, four of my notes are fully paid and one is late by 16-30 days. I’m well diversified! In addition to diversifying across many notes, I also like to spread my risk by time. This is a unique strategy that I haven’t seen anywhere else when it comes to Lending Club. I’m talking about investing incremental amounts of money over time. I try to invest a few hundred dollars here and there. Since August, my investments have added up to a large amount, but it wasn’t always that way. By investing incremental amounts over time, I have hedged my risk even more in case loan default rates are linked to any one range of dates. If you sign up for Lending Club, I recommend this very strategy. Start small (maybe as little as $25) and add more and more money over time! At the end of the day, Lending Club is fundamental in my goal of saving and investing wisely. Also, it’s helping me give back to others (another one of my top goals this year). I’m lending money to people like you and me who need help. If you’re interested in earning a high interest rate, I highly recommend checking out LendingClub. It only takes $25 to start and invest in your first loan!